Area: 33,774 sq. mi. (includes Nakhchivan and Nagorno-Karabakh enclaves); slightly smaller than Maine. Nationality: Noun: Azerbaijani(s), Azeri. Adjective — Azerbaijani, Azeri. Net migration rate (2009 est. ): -1.4 migrants/1,000 population. Health: Infant mortality rate (2010): 52.84 1,000 live births. Life expectancy (2009 est.) — 71.34/62.53 years (women/men). Work force (April 2010): 4.333 million. Agriculture and forestry — 38.3%; wholesale and retail trade; repair of motor vehicles, personal and household goods — 16.1%; education — 8.5%; public administration and defense, social security — 6.8%. Constitution: Approved in November 1995 referendum; amended August 2002 and March 2009. Branches: Executive: president (chief of state), prime minister (head of government), Council of Ministers (cabinet). Legislative — unicameral National Assembly (parliament). Judicial: Supreme Court, Economic Court, Constitutional Court. Administrative subdivisions: 66 rayons, 77 cities, and 1 autonomous republic. Political parties: New Azerbaijan Party, Musavat Party, Popular Front Party, Liberal Party, Democratic Party, National Independence Party, Democratic Reforms Party, Civil Solidarity Party, Hope Party, Justice Party, Communist Party, others. There are more than 40 registered political parties in Azerbaijan and many small, unregistered parties. Agriculture: Products: cotton, tobacco, grain, rice, grapes, fruit, vegetables, tea, cattle, sheep, goats. Industry: Types: petroleum and natural gas, petroleum products, oilfield equipment, steel, iron ore, cement, chemicals, petrochemicals. Azerbaijan combines the heritage of two venerable civilizations — the Seljuk Turks of the 11th century and the ancient Persians. Its name is thought to be derived from the Persian phrase "Land of Fire," referring both to its petroleum deposits, known since ancient times, and to its status as a former center of the Zoroastrian faith. 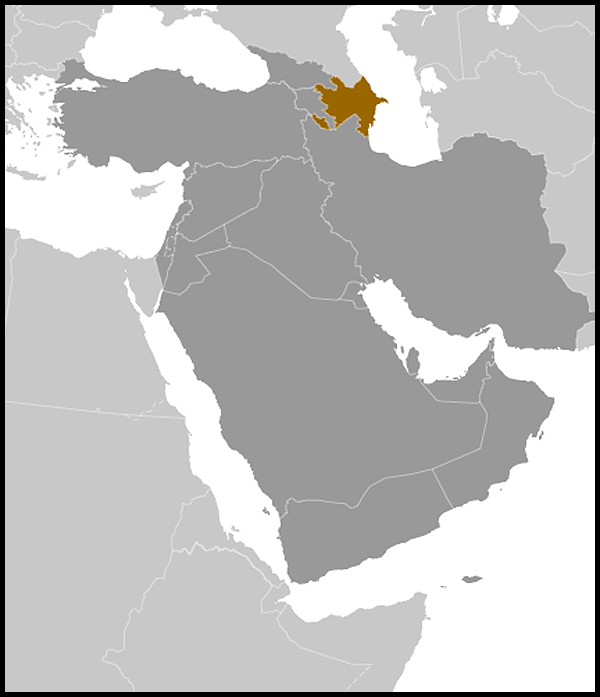 The Azerbaijani Republic borders the Iranian provinces of East and West Azerbaijan, which are predominantly populated by ethnic Azeris. Due to its location on the shore of the Caspian Sea and astride the trade routes connecting Europe to Central Asia and the Near East, Azerbaijan was fought over by Russia, Persia, and the Ottomans. Finally, the Russians split Azerbaijan's territory with Persia in 1828 by the Treaty of Turkmenchay, establishing the present frontiers and extinguishing the last native dynasties of local Azerbaijani khans. The beginning of modern exploitation of the oil fields in the 1870s led to a period of unprecedented prosperity and growth in the years before World War I. Following the collapse of the Russian Empire in 1917, an independent republic was proclaimed in 1918 after an abortive attempt to establish a Transcaucasian Republic with Armenia and Georgia. The first democratic republic in the Muslim world, it gave women the right to vote in 1919. Azerbaijan received de facto recognition by the Allies as an independent nation in January 1920, an independence terminated by the arrival of the Red Army in April. 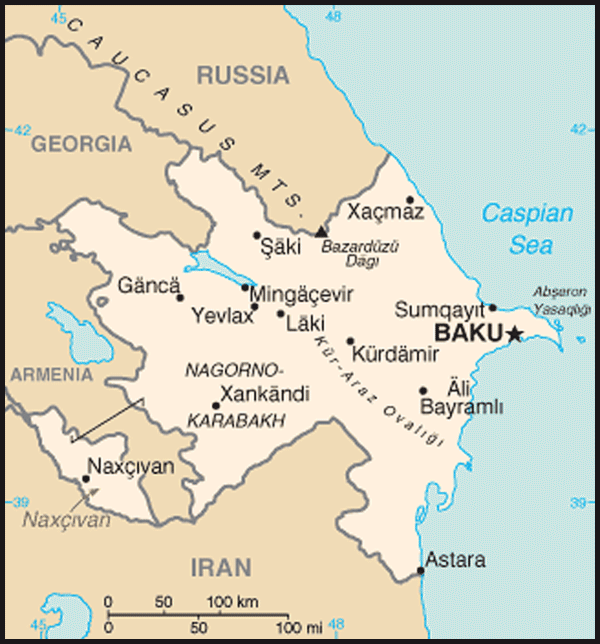 Incorporated into the Transcaucasian Federated Soviet Socialist Republic in 1922, Azerbaijan became a union republic of the U.S.S.R. (Soviet Union) in 1936. The late 1980s were characterized by increasing unrest, eventually leading to a violent confrontation when Soviet troops killed 190 nationalist demonstrators in Baku on January 19-20, 1990. Azerbaijan declared its independence from the U.S.S.R. on August 30, 1991. Although the Government of Azerbaijan consists of three branches, Azerbaijan has a strong presidential system in which the president dominates the legislative and judicial branches. The executive branch is made up of a president, his administration, a prime minister, and the cabinet of ministers. The legislative branch consists of the 125-member parliament (Milli Majlis). Members, all of whom are elected from territorial districts, serve 5-year terms. The judicial branch, headed by a Constitutional Court, is only nominally independent. Azerbaijan declared its independence from the former Soviet Union on August 30, 1991, with Ayaz Mutalibov, former First Secretary of the Azerbaijani Communist Party, becoming the country's first President. Following a March 1992 massacre of Azerbaijanis at Khojali in Nagorno-Karabakh (a predominantly ethnic Armenian region within Azerbaijan), Mutalibov resigned and the country experienced a period of political instability. The old guard returned Mutalibov to power in May 1992, but less than a week later his efforts to suspend a scheduled presidential election and ban all political activity prompted the opposition Popular Front Party (PFP) to organize a resistance movement and take power. Among its reforms, the PFP dissolved the predominantly Communist Supreme Soviet and transferred its functions to the 50-member National Council. Elections in June 1992 resulted in the selection of PFP leader Abulfez Elchibey as the country's second President. The PFP-dominated government, however, proved incapable of either credibly prosecuting the Nagorno-Karabakh conflict or managing the economy, and many PFP officials came to be perceived as corrupt and incompetent. Growing discontent culminated in June 1993 in an armed insurrection in Ganja, Azerbaijan's second-largest city. As the rebels advanced virtually unopposed on Baku, President Elchibey fled to his native province, the Azerbaijani exclave of Nakhchivan. The National Council conferred presidential powers upon its new Speaker, Heydar Aliyev, former First Secretary of the Azerbaijani Communist Party (1969-81) and member of the U.S.S.R. Politburo and U.S.S.R. Deputy Prime Minister (until 1987). Elchibey was formally deposed by a national referendum in August 1993, and Aliyev was elected to a 5-year term as President in October with only token opposition. Aliyev won re-election to another 5-year term in 1998, in an election marred by serious irregularities. A presidential election that took place on October 15, 2003 resulted in the election of Ilham Aliyev, the son of Heydar Aliyev. The election did not meet international standards. Ilham Aliyev assumed the office of president on October 31, 2003. Heydar Aliyev died December 12, 2003. Ilham Aliyev won re-election on October 15, 2008, taking 88.7% of the vote in an election boycotted by the major opposition parties. While the presidential election marked progress toward meeting Organization for Security and Cooperation in Europe (OSCE) commitments and other international standards with regard to some technical aspects of election administration, the election process failed to meet some OSCE standards, according to the final report of the OSCE/Office for Democratic Institutions and Human Rights (ODIHR) election monitoring mission. In December 2008, the Azerbaijani parliament approved a measure calling for the abolition of presidential term limits. After limited public debate, the measure passed in a March 18, 2009 referendum on constitutional amendments. Observers noted serious shortcomings in voting procedures, and in the counting and tabulation process. Azerbaijan's first parliament was elected in 1995. The present 125-member unicameral parliament was elected in November 2005 in an election that did not meet a number of international standards. A majority of parliamentarians are from the President's New Azerbaijan Party. The parliament also includes up to 10 opposition members and a sizeable number of nominal independents. Many of these independents are believed to have close ties to government, while as many as 20 others are business leaders whose political affiliations are not clear. Under the 1995 constitution, the speaker of parliament stands next in line to the President. However, constitutional amendments approved in a flawed process in August 2002 included a provision replacing the speaker of parliament with the prime minister in the line of succession to the presidency. The parliament remains a weak body with little real influence. Parliamentary elections in November 2010 did not meet international standards. They were marred by a deficient candidate registration process, limits on freedom of assembly and expression, a restrictive political environment, unbalanced media coverage of candidates, and problems in vote counting and tabulation. No opposition parties were elected in November 2010. The human rights situation in the country remains poor, with backsliding in some areas, especially media freedom, religious freedom, and political participation. Restrictions on freedom of assembly, expression, and religion continue, as do arbitrary arrest and detention, and the imprisonment of persons for politically motivated reasons. Over the last few years, political space for opposition voices has become more limited. Arrests and detention for unregistered religious activity continues in some localities. In recent years, authorities have also destroyed or closed a number of mosques. Corruption remains pervasive, as does the lack of accountability for torture of individuals in detention, violence against journalists, and excessive use of force against peaceful demonstrators. Azerbaijan's Embassy in the United States is at 2741 34th Street NW, Washington, DC 20008; tel. (202) 337-3500; fax (202) 337-5911; Consular tel. (202) 337-5912; Consular fax (202) 337-5913; (http://azembassy.us/new/). Azerbaijan is an economy in transition in which the state continues to play a dominant role. It has important oil reserves and significant agricultural potential based on a wide variety of climatic zones. During the late 1990s, in cooperation with the International Monetary Fund (IMF), Azerbaijan pursued a successful economic stabilization program, with annual growth exceeding 10% since 2000. In 2010 Azerbaijan's gross domestic product increased by 5%. Output expansion has been largely driven by oil-sector foreign direct investment (FDI) and related spillover effects in the construction and transportation sectors, although there have also been substantial gains in agriculture. Inflation remains a major risk that could accelerate in the context of further increases in fiscal spending, high oil prices, and an inflexible exchange rate. Factors attributable to the global financial crisis may mitigate some of the inflationary trend, however. Importantly, the higher inflation also reflects customs restrictions that are in place due to supply constraints that limit import competition and to monopolies that continue to control many sectors of the economy. 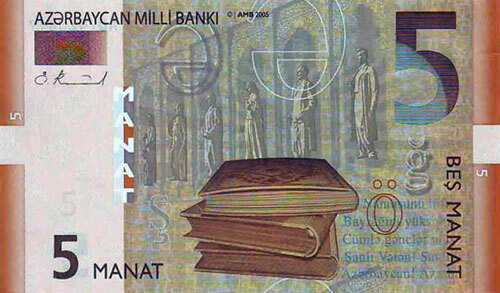 The national currency, the Manat (AZN), is artificially stable and was allowed to appreciate against the dollar by 6.1% in 2005, 5.4% in 2006, 3.4% in 2007, and 1.1% in 2008. By early 2009, one AZN was worth $1.24, an exchange rate that has remained steady ever since, increasing only slightly since late 2010. 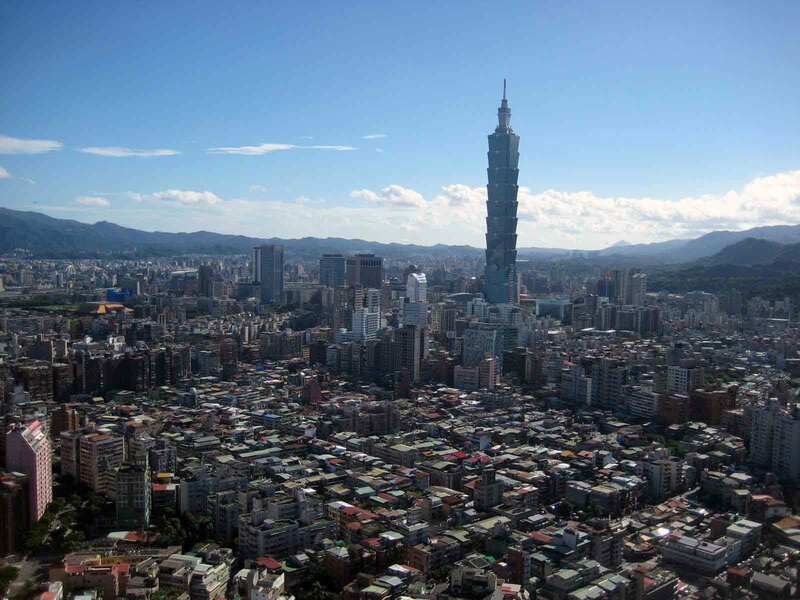 The 2010 consolidated state budget set spending at 13.5 billion AZN, an increase of about 10% over 2009. The IMF has expressed concern about the impact on inflation and macroeconomic stability as well as governance if the capital budget is not well managed. The State Oil Fund (SOFAZ) was established as an extra-budgetary fund to ensure macroeconomic stability, transparency in the management of oil revenue, and the safeguarding of resources for future generations. All oil revenue profits from the development of new oil fields now flow into SOFAZ, and are held offshore. The State Oil Fund continues to play a critical role in promoting macroeconomic stability and in dampening the impact of massive energy revenues upon the economy. As of January 2011, SOFAZ reported assets of $22.7 billion. These assets constitute a 32% increase over SOFAZ's January 2009 reported assets ($10 billion). In 2007, the United Nations awarded SOFAZ a public service award for its transparency, accountability, and responsiveness in the public sector. Nevertheless, SOFAZ's effect is limited since it does not cover SOCAR, the State Oil Company. Both the IMF and the World Bank continue to emphasize the need to coordinate the budget planning process to integrate a medium-term spending framework with financing plans and the government's broader oil-revenue management strategy. Azerbaijan has made efforts to modernize and reform its economy. The government has undertaken regulatory reforms in some areas, including substantial opening of trade policy, but inefficient public administration, in which commercial and regulatory interests are co-mingled, limits the impact of these reforms. The government has largely completed privatization of agricultural lands and small and medium-sized enterprises. Azerbaijan is still plagued by an arbitrary tax and customs administration, a court system lacking independence, monopolistic regulation of the market, and systemic corruption. Azerbaijan is considered one of the most important spots in the world for oil exploration and development. Proven oil reserves in the Caspian Basin, which Azerbaijan shares with Russia, Kazakhstan, Turkmenistan, and Iran, are comparable in size to North Sea reserves several decades ago. Azerbaijan has concluded 28 production-sharing agreements with various oil companies. Azerbaijan celebrated first oil for the Baku-Tbilisi-Ceyhan (BTC) pipeline in May 2005, and the official completion ceremony was held in Turkey in July 2006. The BTC pipeline is now operational and has a maximum capacity of one million barrels per day. A parallel Baku-Tbilisi-Erzurum gas export pipeline opened in September 2006. In October 2008, the first tanker carrying oil from Kazakhstan's Tengiz field departed for Azerbaijan. New pipeline and delivery route systems for natural gas through the southern corridor to Europe are currently being considered and negotiated. Azerbaijan faces serious environmental challenges. Soil throughout the region was contaminated by DDT and toxic defoliants used in cotton production during the Soviet era. Caspian petroleum and petrochemicals industries also have contributed to present air and water pollution problems. Several environmental organizations exist in Azerbaijan, yet few funds have been allocated to begin the necessary cleanup and prevention programs. Over-fishing by poachers is threatening the survival of Caspian sturgeon stocks, the source of most of the world's supply of caviar. The Convention on International Trade in Endangered Species (CITES) has listed as threatened all sturgeon species, including all commercial Caspian varieties. CITES imposed a ban on most Caspian caviar in January 2006, but lifted the ban a year later in favor of quotas. A March 2010 CITES conference labeled Caspian beluga sturgeon as 'critically endangered,' but as of yet no changes have been made to current sturgeon fishing quotas. In July 1992, Azerbaijan ratified the Treaty on Conventional Armed Forces in Europe (CFE), which establishes comprehensive limits on key categories of conventional military equipment and provides for the destruction of weaponry in excess of those limits. Although Azerbaijan did not provide all data required by the treaty on its conventional forces at that time, it has accepted on-site inspections of forces on its territory. Azerbaijan approved the CFE flank agreement in May 1997. It also has acceded to the nuclear Non-Proliferation Treaty as a non-nuclear weapons state. Azerbaijan participates in the North Atlantic Treaty Organization's (NATO) Partnership for Peace, and maintains a presence of over 90 troops in Afghanistan. Azerbaijan also maintained a peacekeeping deployment in Iraq until November 2008. Azerbaijan is a member of the United Nations, the Organization for Security and Cooperation in Europe (OSCE), NATO's Partnership for Peace, the Euro-Atlantic Partnership, the World Health Organization, the GUAM (Georgia, Ukraine, Azerbaijan, and Moldova) Organization for Democracy and Economic Development, the European Bank for Reconstruction and Development, the Council of Europe, the International Monetary Fund, the Organization of the Islamic Conference, and the World Bank. Azerbaijan is an observer at the Community of Democracies. More than 30,000 people were killed in the fighting from 1992 to 1994. In May 1992, Armenian and Karabakhi forces seized Shusha (the historical Azerbaijani-populated capital of Nagorno-Karabakh) and Lachin (thereby linking Nagorno-Karabakh to Armenia). By October 1993, Armenian and Karabakhi forces controlled almost all of Nagorno-Karabakh, Lachin, and large adjacent areas in southwestern Azerbaijan. As Armenian and Karabakhi forces advanced, hundreds of thousands of Azerbaijani refugees fled to other parts of Azerbaijan. In 1993, the UN Security Council adopted resolutions calling for the cessation of hostilities, unimpeded access for international humanitarian relief efforts, and the eventual deployment of a peacekeeping force in the region. The UN also called for immediate withdrawal of all occupying forces from the occupied areas of Azerbaijan. Fighting continued, however, until May 1994 when Russia brokered a cease-fire. Negotiations to resolve the conflict peacefully have been ongoing since 1992 under the aegis of the Minsk Group of the OSCE. The Minsk Group is currently co-chaired by Russia, France, and the U.S. and has representation from several European nations, Armenia, and Azerbaijan. Despite the 1994 cease-fire, sporadic violations, sniper fire, and landmine incidents continue to claim many lives each year. Since 1997, the Minsk Group Co-Chairs have presented a number of proposals to serve as a framework for resolving the conflict. One side or the other rejected each of those proposals, but negotiations have continued at an intensified pace since 2004. In November 2007, on the margins of the OSCE Ministerial Council in Madrid, the ministerial-level representatives of the three Co-Chair countries presented the sides with a proposal on the "Basic Principles for the peaceful settlement of the Nagorno-Karabakh conflict." In 2008, Azerbaijani President Aliyev and Armenian President Serzh Sargsian met twice, in June in St. Petersburg and in November in Moscow. After the Moscow talks, the two Presidents signed a declaration expressing their intent to seek a political settlement to the conflict, to resume confidence-building measures, and to intensify negotiations within the Minsk Group framework on the basis of the Madrid proposal. The Co-Chairs have continued their intensive consultations with the sides to narrow differences on the revised Basic Principles, including through three meetings between the Presidents of Armenia and Azerbaijan in 2010. In December 2010, the Armenian and Azerbaijani Presidents, along with the heads of delegation of the Minsk Group Co-Chair countries, issued a joint statement during the OSCE Summit in Astana, acknowledging the need for more decisive efforts to resolve the Nagorno-Karabakh conflict and reaffirming their commitment to seek a final settlement based on the principles and norms of international law; the United Nations Charter; the Helsinki Final Act; and previous joint statements by the Presidents of the Minsk Group Co-Chair countries. The United States has been actively engaged in international efforts to find a peaceful solution to the Nagorno-Karabakh conflict. The U.S. has played a leading role in the Minsk Group, which was created in 1992 by the Conference on Security and Cooperation in Europe — now the OSCE — to encourage a peaceful, negotiated resolution to the conflict between Azerbaijan and Armenia. In early 1997, the U.S. heightened its role by becoming a Co-Chair of the Minsk Group, along with Russia and France. The U.S. supports American investment in Azerbaijan. U.S. companies are involved in offshore oil development projects with Azerbaijan and have been exploring emerging investment opportunities in Azerbaijan in telecommunications and other fields. The United States is committed to aiding a transition to democracy in Azerbaijan and its formation of an open market economy. The FREEDOM Support Act of 1992 has been the cornerstone of U.S. efforts to help Azerbaijan during this transition. Under the Freedom Support Act, the U.S. provided approximately $22 million in humanitarian, democracy, and economic reform assistance to Azerbaijan in FY 2010. The U.S. and Azerbaijan have signed a bilateral trade agreement, which entered into force in April 1995 and confers on Azerbaijan the status of "most favored nation". The United States also has a bilateral investment treaty with Azerbaijan and in 2008 named Azerbaijan a beneficiary country under the Generalized System of Preferences program. The United States seeks to encourage reforms in Azerbaijan that promote regional security, the development of key democratic institutions and processes, and sustainable economic growth. Programs implemented by the Departments of State and Justice and the U.S. Agency for International Development (USAID) work to advance democracy by promoting civic participation, supporting media freedom and greater access to objective information, improving access to justice, enhancing parliamentary transparency and responsiveness to constituents, combating corruption, and building judicial and prosecutorial capacity to handle complex cases, including financial crimes. U.S. assistance also supports diversified economic growth by addressing critical policy and institutional constraints and promoting sustainable and broad-based growth of the non-oil sectors. USAID provides technical assistance to combat money laundering and terrorist financing and promotes legislative reforms to reduce technical barriers to trade and help advance Azerbaijan's bid for WTO accession. Projects that target private sector competitiveness are implemented by USAID and the U.S. Department of Agriculture and focus on the development of key rural and agricultural sectors. Security assistance works to enhance Azerbaijan's ability to contribute more effectively to international efforts on peacekeeping, counterterrorism, combating weapons of mass destruction, nonproliferation and counternarcotics. The Departments of Defense and State work with Azerbaijan's security forces to provide training and equipment in priority areas, including maritime security in the Caspian Sea and NATO interoperability. In the social sector, USAID's assistance programs focus on strengthening primary healthcare, family planning, maternal and reproductive health, emergency medicine, and TB prevention and treatment. In addition, the Department of State Humanitarian Program supports vulnerable groups, especially internally displaced persons (IDPs), throughout Azerbaijan. Projects deliver and distribute donated assistance in the form of medical supplies, food, clothing, and emergency shelter items, and respond to urgent needs. The Humanitarian Program also implements small reconstruction projects that provide structural repairs to recipient institutions, including orphanages, homes for the elderly, and clinics. The U.S. Embassy (http://azerbaijan.usembassy.gov/) in Baku, Azerbaijan is at 83 Azadliq Prospect; tel. 994-12-98-03-35; fax 994-12-65-66-71.